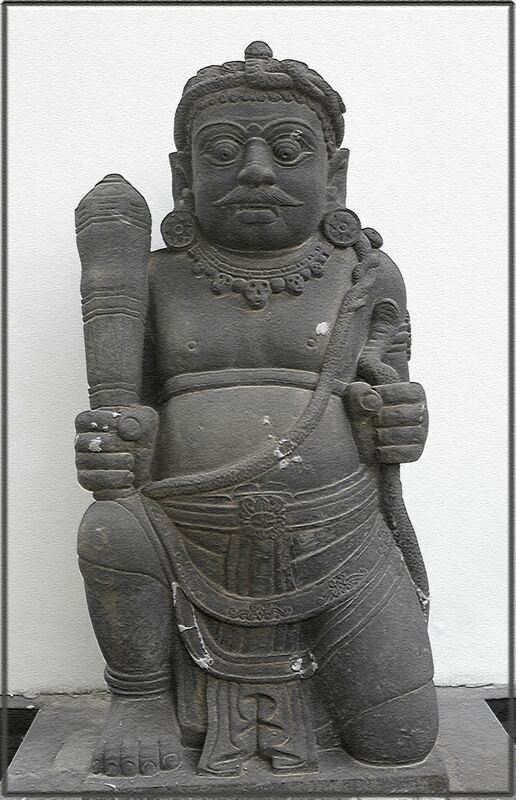 Dwarapala is a statue of a door or gate guardian, often portrayed as a warrior or fearsome giant, usually armed with a weapon, the most common being a mace. They are usually placed outside the temple or other building to protect the area therein. The pair at the cache's coordinates were brought from Java, after being carved from large pieces of volcanic rock, and are guarding the entrance doors to the Eastern Wing of the Ubud Palace, the Puri Agung Ubud. They are symbolically dressed for special occasions. Please be discreet in your search, and be aware that the ‘fruit lady’ and the supervisor of the Eastern Wing know about the cache but have been asked not to assist in your searching. Please make sure you leave the cache well covered.